The delegates received ten days of intensive training by STOE, DECTRIS and Xenocs staff and guest scientists in cooperation with the IUCr. The opening ceremony was held in Darmstadt on September 10th, where STOE offered a warm welcome to the participants. This was followed by a first lecture in which DECTRIS took the delegates to an exciting journey through the instrumentation for X-ray analysis. From laboratory to synchrotron sources, advances of modern instrumentation were presented on several examples of difficult structures, whose solution was possible only owing to the features of MYTHEN and PILATUS detectors. In Grenoble, after a fascinating introduction on the history of crystallography and today’s challenges by Jean-Louis Hodeau, Directeur de Recherche at Institut Neel-CNRS, member of the IUCr Synchrotron commission, the delegates received theoretical & practical training on Small Angle X-ray Scattering. Four different workshops were organized at Xenocs Headquarters so that the participants could get in-depth knowledge on Xenocs sources & optics, Xenocs SAXS/WAXS systems and data treatment software, with experiments carried out on the Xeuss 2.0 SAXS/WAXS system. 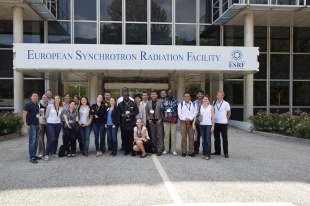 The delegates also visited the European Synchrotron Radiation Facility (ESRF) and more specifically the ID02 SAXS beamline. A sunny week-end spent discovering Grenoble old town and a breathtaking view of the Mont Blanc from the Bastille fortified site ended the first part of the OpenFactory very nicely. 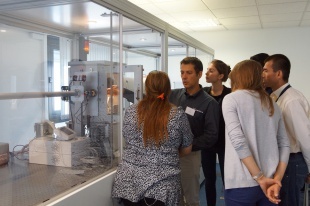 In Darmstadt, the participants were trained in single crystal and powder XRD at STOE’s labs. The training involved one day of theoretical lectures, while two full days focused on hands-on workshops, from sample preparation to structure determination: for x-ray single crystal as well as x-ray powder diffraction. As part of this, the participants performed measurements on the STOE IPDS 2/2T and STADIVARI Single Crystal Diffractometer, and STADI P and STADI MP Powder Diffractometer. Thereafter, the participants joined STOE’s Single Crystal User Meeting, which included, among others, talks on Scaling, Indexing and Extreme Conditions Crystallography by STOE’s scientists. Furthermore, Prof. Dr. Dieter Fenske, Karlsruhe Institute of Technology, gave an impressive talk on “Nanosized Transition Metal Clusters; Synthesis, Structures and Properties" followed by Prof. Dr. Harald Krautscheid, University of Leipzig, presenting his fascinating work on Metal-Organic Frameworks. As a highlight, Prof. Dr. Gautam R. Desiraju, immediate past president of the IUCR, has held his premier speech on “100 years of Crystallography: Seen through 15 small molecule crystal structures” – in which he has illustrated some of the most fascinating developments over a timespan of a century. The feedback of the participants was overwhelming. Next to all the knowledge being shared, it has been impressive how strong ties have been built among the participants – connecting young crystallographers from across the world in the spirit of IYCr 2014.